I know there is a really pretty spring collection but it is not in stores yet. What I did discover were the Creative Art Edition Make Up Palettes. I was intrigued by the eye catching design of the palettes so I took a good look! Vol. 1 is contains an eyeshadow primer, three eyeshadows, two eyebrow powders, eyebrow wax and mascara for daytime eyes and Vol. 2 is the night-time version. I think it’s great that the mascara is included. The eyebrow powder looks dark enough to use for me as I use grey-brown eyebrow products. Black looks strange, even though I have black eyebrows. I guess if the eyebrow shades are not suitable the clear wax can be used to at least neaten the eyebrows. The applicators look ok – the angled brow brush can double as an eyeliner brush. In fact, the only downside to the palettes is that there isn’t a black or very dark coloured eyeshadow to use as an eyeliner. If I didn’t have a separate eyeliner to hand, I would use the darkest eyebrow powder as an eyeliner and hope it works out! Vol.3 and Vol. 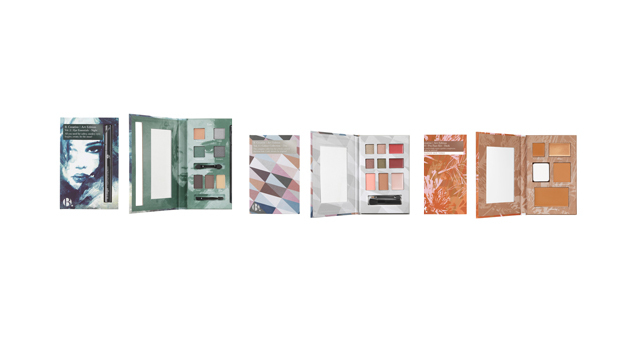 4 are day and night palettes respectively which are face palettes. They contain four eyeshadows, two blushers, two lipsticks and one highlighter. I am more used to seeing this type of palette but the difference here is that I love the packaging design! I’m not a fan of lip colour palettes as I find them inconvenient to carry around for touch-ups. I prefer to replenish my lipstick or gloss with a quick swipe from the tube rather than having to get out a mirror and lip brush to re-paint on the colour. Having said that, if the colours could be worn like a balm or stain and don’t need precision application, I would be more willing to use them. I think to get the best out of the eye and face palettes, I would buy one of each (or all four!). Just when I thought it couldn’t get any better, I noticed there were four Creative Art Edition face kits which are palettes containing everything needed for your complexion: highlighter, cream foundation, pressed powder and concealer. I think my shade would be Vol. 8 which is called Dark and is the darkest shade available. This is the only downside to the complexion collection – I by no means have the darkest skin so this will be disappointing to many of you. Hopefully a darker palette will be released – B. already do darker shades in their oil control foundation. The only applicator included is one sponge so I would use one side for the cream foundation and the other side for the powder. If I didn’t have any other brushes with me, I would apply the concealer and the highlighter with my fingers (although I really am a brush person so I would find this painful!). In all, it looks like if you get one eye palette, one face palette and one complexion palette, that’s a full face for only £45 plus Beautycard points! If you can get the B. Creative Art Edition Palettes on special offer that would be even better. My first impressions are that the B Creative Art Edition Palettes are a really good idea and great value for money. They come in beautiful packaging so would be great gifts. They would make a really nice starter kit for those new to makeup and they would also be good as a travel kit.